More Chinese New Year preparation sort of recipes. 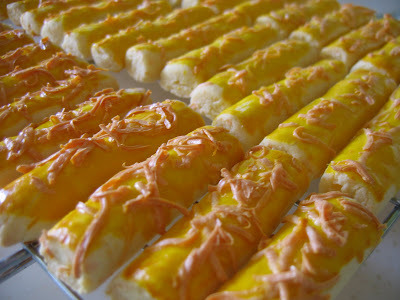 This cheese stick biscuits (cookies, if you're American *winks*) , is a recipe from a Moderator, Jam, from moms4moms.org. Moms4Moms is a forum for Singapore parents and topics on the board range from dealing with children to family issues to lifestyle issues. The forums' cooking and baking threads are always a chockful of interesting recipes to try out - especially familiar family favourites. Golden Bamboos all ready for munching! 1. Beat butter and egg in a mixer till creamy, then add in the vanilla essence, the flour and the cornflour. Mix well. 2. Add in the grated cheese and continue mixing till all are evenly mixed. 3. Roll the dough into long strips. 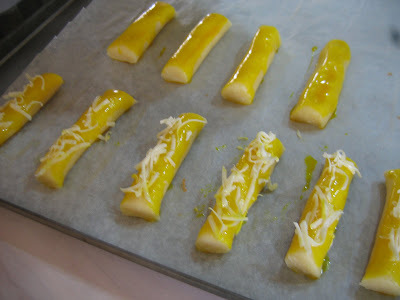 Cut the strips into about 1 1/2 inches (see picture) and place it onto a baking tray lined with baking paper. 5. Grate more cheddar cheese and sprinkle over the strips. 6. Bake in a preheated oven of 180 deg Celsius for 18-20 minutes.